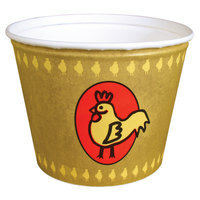 You can find paper chicken buckets in several different styles, so you can find the perfect product for your restaurant. Different sizes allow you to perfectly portion your small, medium, and large orders, and designs on the outside of the buckets add some flair to your take-out orders. Some options feature fun cartoon chickens to remind guests of what is inside, while others have a more classic look that can easily be labeled with their names or the type of food that’s inside. Also make sure to check out other great items from Choice and Dart Solo. 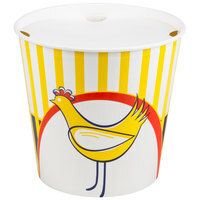 Paper chicken buckets allow your guests to take home your delicious, fried chicken and sides without worrying about grease leaking out. 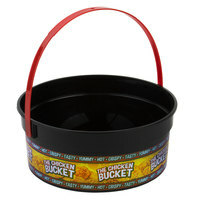 The waxy material keeps the bucket from absorbing moisture or grease, which can make it lose its shape, and makes sure the bucket doesn’t leak. Each bucket also features a lid to ensure your food is hot, fresh, and delicious after transport. 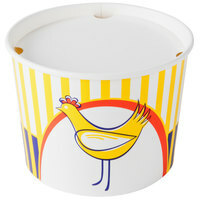 You can find chicken buckets in different sizes and designs to find the perfect option for your restaurant. For other ways to send food home with your customers, check out our chicken boxes, chicken take-out containers, and paper cups. 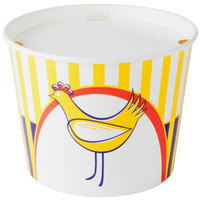 If you're wondering where to buy paper chicken buckets, we have a large selection of paper chicken buckets for sale at the lowest prices.